French architecture studio, AAVP led by Vincent Parreira - one of the judges in the Next Landmark 2017 international contest - has converted a photography studio in Paris into two apartments. French architecture studio, AAVP led by Vincent Parreira - one of the judges in the Next Landmark 2017 international contest - has converted a photography studio in Paris into two apartments. A dedicated project in a historical context with surprising visual results. 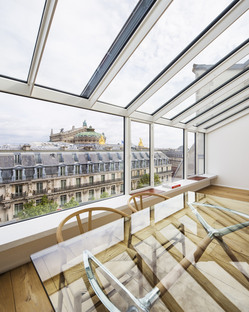 French architect Vincent Parreia, director of French architecture studio AAVP, known to our readers as a judge in the Next Landmark 2017 international context (link NL) and for his LESS housing project in Paris (link), has completed another project in the French capital, on a smaller scale: the conversion of a 19th-century photography studio into two duplex apartments. A historical building with an iconic glass roof that Vincent Parreira replaced with a modern, high energy performance covering. The new roof is the same size as the 1899 version, and the glazing is in exactly the same position as the original but now the whole thing has a contemporary style with double-glazed, anti-intrusion, slightly reflecting glass. So, the architect retained the narrative of the late 1800s and at the same time met the desire for innovation and living comfort. A decision also underscored by the solutions adopted for the interiors, revamped with a view to the new end use and the split into two separate apartments, where Parreira carefully studied the contingent needs, including access to the site, protection of the existing structure and building permit requirements. White walls and light-coloured timber floors dominate both apartments but they differ in certain details, like the shape of the connecting staircase and the bespoke furnishings. The bedrooms in both apartments are located on the lower floor, dedicating the upper floor with its unparalleled views over the Paris rooftops to the living area. Vincent Parreira's AAVP studio stresses how this small-scale work can be at the same time extremely elegant, as well as showcasing his trademark focus on details and contexts. Vincent Parreira, together with the other judges of Next Landmark 2017, under the title Architectural Skin, will be judging the submissions for a pattern that can be created using a new technique of printing on a ceramic medium. The winners of the contest's two categories will have a chance to meet Parreira personally during the awards ceremony in Moscow.